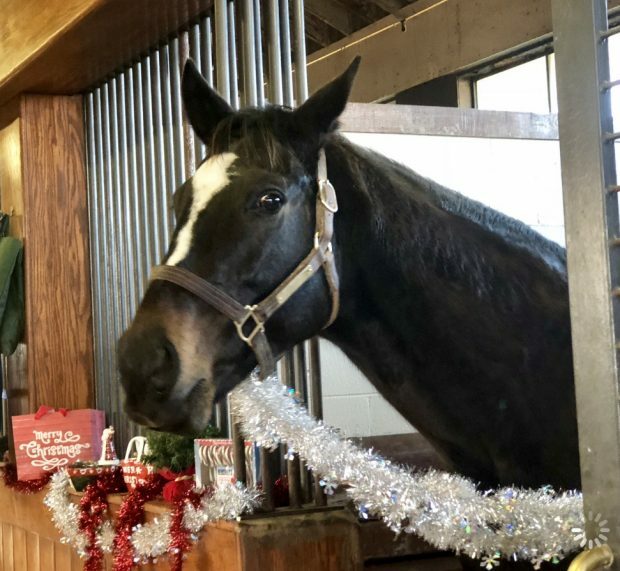 Zenyatta with Charles Campbell at Lane’s End Farm, Christmas 2018. 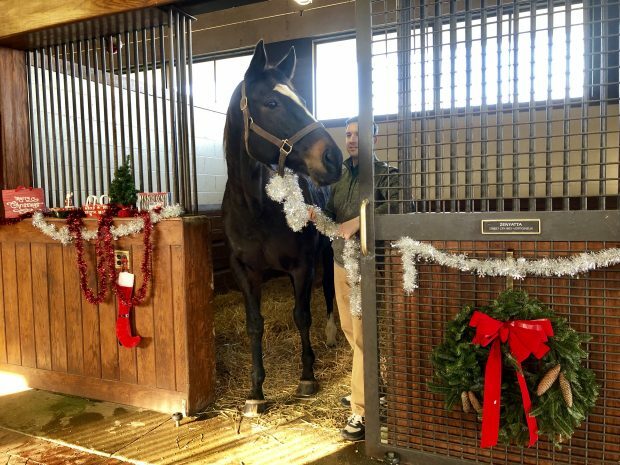 Zenyatta’s stall was decked out for the holiday with her favorite cookies and candy canes. Thank you to the staff at Lane’s End for taking such great care of her and bringing so much cheer. We wish everyone a joyous and peaceful holiday. 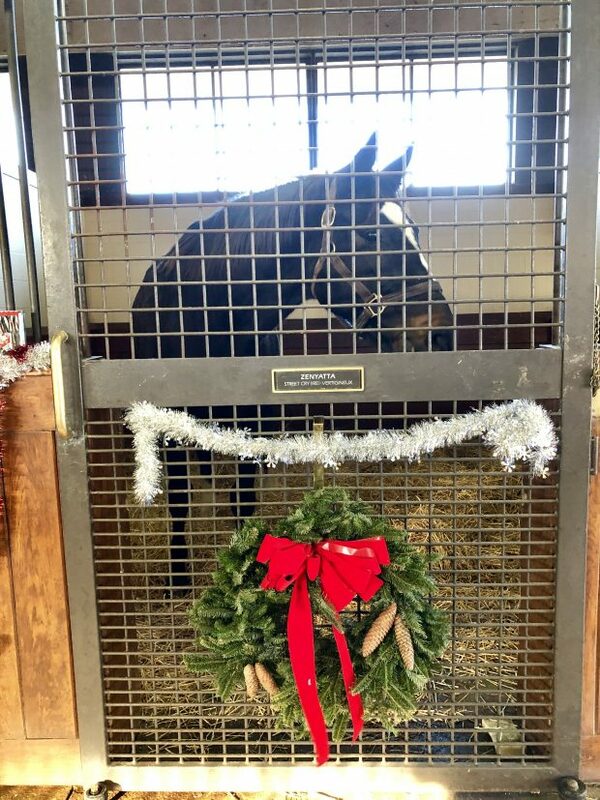 Zenyatta’s stall, decorated for the holiday. 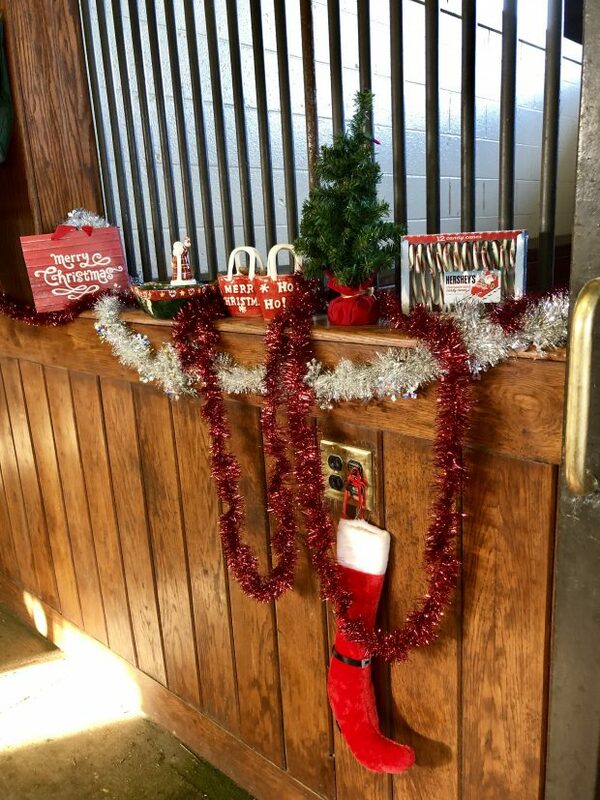 Holiday decorations from the staff at Lane’s End. De Sousa stables have joined twitter! Carol Channing was certainly one of a kind — she was an amazing lady. Goodnight “Dolly Levi”. Dear Judy.Love the video of Zenyatta.It will be good to have a name for Z17.Mike and Cynthia’s wedding was beautiful.The bride looked gorgeous. I didn’t see any photos or videos of Mikey and his new bride; I was just congratulating them in my post to Sheena. In Sheena’s post above, she mentioned that Cynthia looked beautiful. So maybe she saw photos on Mike’s Facebook page. Thanks for posting Kari’s video of our Dancing Queen. Such a joyful sight. Don’t think the ones behind her in the post parade were real thrilled, but when you are the Queen you can dance when and where you want. We are dealing with snow and ice here and more to come. The video brought some happiness to the day. Have been stuck in the house for several days and going batso! Congrats to Coz and Isabella. Sheena, Thanks for some news of Z17. You’re so welcome; love that video. Always strikes me how all of the other horses are just walking in the post parade and our Queen is dancing away. Such a special girl. A very sad story.Gilpin suffered a ruptured artery and Natasha was killed in the fall.Thoughts and prayers with her family and friends.She was just 22.It goes to show we may not always have tomorrow.RIP Gilpin. My apologies.The groom’s name was Natasha Galpin.The horse’s name was not mentioned.Mistake in the link too with her name.Confusing. AP Indy dressed for the cold. Thanks for sharing this photo of Indy in his blanket. 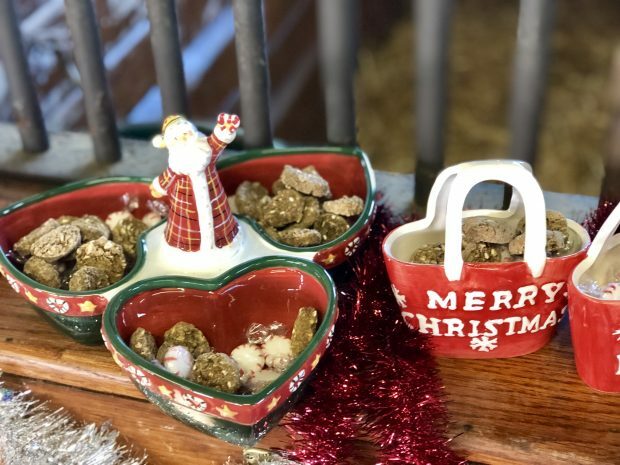 Lane’s End takes great care of him, Z and all their horses. Aerolithe, a beautiful gray mare has just arrived from Japan to race in the Pegasus. She has very pretty markings and face. Imagine my happiness when I found that she is a great granddaughter of my beloved Alydar! Seems horses from all around the world are coming for the race. Just saw that Thunder Snow is going to race in Dubai this year. Good luck and healthy to him. Prayers for peace for Natasha’s loved ones. So sad to lose one so young. We can never forget that this is a dangerous sport for both horse and rider. Sorry for my mistake in thinking Sheena was the one who posted about Z17. You both are so good about letting the rest of us know what is going on. I am so glad they are holding her out and did not start her at 2. With that May birthday she should be much better off starting later like mom. Simon Sherwood talks about his win in the Clarence House 30yrs ago.Dessie was giving nearly 2st to Panto Prince and 2m was’nt his favourite distance. Winx meets a very special fan. Alpha Centauri will be covered by Galileo and Love the Chase by Accelerate. They look very happy. Congrats and all the best to Mike and Cynthia. Happy Birthday and Best Wishes to Betty White on the occasion of her 98th, I think! What a talented and wonderful lady! An American treasure. Betty White is 97 — born January 17, 1922. Always great at any age however! Hovis prepares for his visit to God’s own country and Kevin’s eviction.We’ll all be on tenterhooks on monday.Stay safe my love. All positive thoughts, vibes and prayers are being sent to Hovis, Karen and all who love them. Always grateful for that wonderful sense of humor possessed by Karen and her Hoverine. Stay strong and power up, brave one. The Hovite Army is pulling for you and wishing you a smooth successful operation. Thanks for keeping us posted, Sheena. Thanks for the news on Hovis. Sending good thoughts and prayers to him for a successful surgery and rapid healing. Found these photos of Mike and Cynthia’s special day. Thank you for the photos, Sheena. Mike looks so happy! I am very happy for him and his new wife. May they have a long wonderful life of love together. Wow! Kudos to the large animal rescue team in Orange county California for safely getting this horse out of the dumpster. Really well done! Thankfully, the horse seems to be fine. Yay! Continued good health and happiness to “King G”! Lovely little video of the King…Galileo.21 this year. Coz enjoying his winter holidays. Thanks for sharing the photos of COZ and his BFF, Giant. They look wonderful. How Altior has helped .Debbie conquer her anxiety and she gets to visit Seven Barrows tomorrow.A lovely story. Hovis has arrived at Rainbow but was annoyed at the lack of catering(no breakfast)!! Hope all is going well with Hovis and he will get some food soon. Don’t guess he does coffee in the mornings. Galileo looks wonderful. What a champion sire he has been. Many more years of good health to him. Beholder’s little princess is beautiful. She is horse royalty with Beholder as a mom and Curlin as a dad. Thanks for news of Coz. It is so joyful to all of us to see him so happy and content. We have been snowed in for two weekends in a row and our high temp for today is 14! Everyone stay warm and hang in there. January will be over soon. Here in upstate NY, our high today was predicted to be 5, but I don’t know if we even made that. It was still -2 when I was coming home from having blood drawn at 12:30 pm. The wind chills were 25-35 below. We’ll have another frigid night tonight with temps below 0. Thank God we’ll warm up to about 20 tomorrow ! We had 13.9″ of snow from the weekend storm & people are still digging out. The high winds keep blowing the light snow back into the cleared spots. Congratulations to Beholder and her beautiful filly princess! Baby B is adorable! Hang in there, Hovis. Hopefully, the worst is over and the infection is what was causing the problems. Trust our boy not to have a Kevin but Mervin the mystery mass .All was going well until they got to the pedal bone and found some pretty nasty infected tissue they have sent this mass off to be tested. (Nothing serious PLEASE)He lost a lot of blood and now has a big hole in his hoof but was happily munching hay.Prayers still needed! Hovis is on all 4 hooves and as you would expect not talking to mother!This is what you put me through on a monday morning.Karen said he was a superstar only mild sedation and a nerve block.He’s on pain relief and high strength antibiotics plus he has a salmon pink dressing!! !Hopefully he can come home on friday. It was fun following him at Akindale. He always found the biggest mud puddle to get into, especially following a grooming session. Thanks for posting these links. I forgot that Black Tie Affair was at Old Friends. I always enjoyed the birthday celebrations Akindale had with Evening Attire on Valentine’s Day. Born on the day for sweethearts and he ended up capturing the hearts of fans and Akindale staff. Beautiful boys indeed! RIP Evening Attire — running with Black Tie Affair now. Thanks for the posts, Judy. Some photos of the big guy,He will have much to say on friday. Healing Prayers for Hovis; sweet boy.